Sacramental theology has often been a challenging area of conversation between Catholics and Protestants. In Christ's Gift, Our Response, Benjamin Durheim envisions a collaborative way forward, forging a conversation between two contemporary approaches to the connection between sacraments and ethics. Drawing primarily from Louis-Marie Chauvet and the Finnish School of Luther Interpretation, Durheim constructs a mutually enriching theological dialogue. Beyond comparison and contrast, this is an attempt to draw these theologies together as sources for each other, rather than as competitors. Benjamin Durheim received his PhD from Boston College and is a visiting assistant professor of theology at the College of Saint Benedict and Saint John's University in Collegeville, Minnesota. He has published articles on liturgical and sacramental theology, especially as they relate to issues of Christian identity and ecumenical conversation. "This slim volume demonstrates how the work of theologians separated by so many differences can be mutually enriching. It is even possible that it could begin a conversation between the Finns and the Radical Lutherans about what happens to the Christian once she is justified. In doing so, it could demonstrate that even the difficult ecumenism within a tradition requires the good will to receive gifts from theologians with whom we otherwise disagree." "[Durheim's] model of setting up a stage for conversation is one that ought to be valued and replicated in the milieu of celebrating the work of reform in the Christian Church." 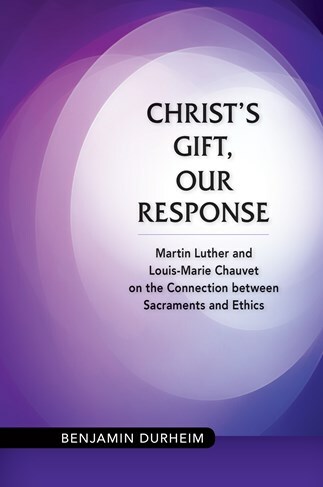 "In this book, Benjamin Durheim builds bridges, creatively and with sensitivity, for theological resonance between thinkers one might rarely see in dialogue-Martin Luther and Louis-Marie Chauvet. His analysis of their theology, their questions and tensions, opens up areas of surprising consensus and continued challenges. Durheim is able, to use his own phrase, `to establish a common basis for theological exchange in the connection between sacraments and ethics.'" This very timely and creative work brings together key items on the contemporary theological scene—sacraments, ethics, ecumenism, and the approaching anniversary of the Protestant Reformation. It sparks flashes of new insight into theology and the practical Christian life. Durheim repositions the heirs of the great reformer Martin Luther and of Catholicism's Thomas Aquinas, replacing the original Reformation battle over faith and works, grace and free will, individual believer and sacramental system with a rich exchange. Here, differences yield a mutual expansion of horizons, not a standoff of mutual condemnation. Durheim's fresh and unusual sacramental theology speaks to the global justice questions so vital to today's faithful and their churches. For both Luther and Louis-Marie Chauvet the sacraments mediate God's gift of transformed Christian action. With Chauvet, Durheim insists that faith is meaningless without commitment to social justice; with Luther, he reminds us that progress is entirely reliant on God's grace. Christ's Gift, Our Response will reward all who value the integration of theology, liturgy, and life. "Durheim's text provides an intriguing method for ecumenical conversation. This book would serve well for undergraduate and graduate students looking at sacramental theology, ethics, or ecumenical dialogue between Lutherans and Roman Catholics. Durheim's work highlights the ethical assumptions of both sides and introduces the reader to an appreciation of the fullness of understandings within the Christian Church regarding the source, norm, and goal of ethics." Building on the principle in ecumenical dialogue of an exchange of gifts, Durheim develops a methodology of theological enrichment by which an awareness of theological resonances may lead toward mutually beneficial insights. His study of the sacramental theology and ethics of Luther and Chauvet gives flesh to this methodology, thus not only exposing and advancing current thinking about these two theologians but also helping to build bridges between Lutherans and Roman Catholics today. Readers interested in ecumenical engagement, sacramental theology, Christian ethics, and the interrelations of these three will appreciate Durheim's fresh approach. Durheim's Christ's Gift, Our Response offers readers on both sides of the Tiber an opportunity for theological enrichment. The theology of Luther and his contemporary interpreters is set alongside that of the contemporary French Catholic Chauvet, a thinker influenced by postmodern philosophy and such heirs of Lutheran thought and Heidegger and Nietzsche. Durheim does not argue for a unified thesis concerning the Eucharist and ethics but rather demonstrates where Chauvet and Luther, Catholics and Protestants, and postmoderns and late medievalists can begin to see each other as sources of insight. Such is necessary for those who wish both to increase their own faith and to work toward a more unified Christian community.